Revealed: Mercedes-Benz E-Class Coupe | What Car? This is the Mercedes-Benz E-Class Coupe, which will be unveiled at the Geneva motor show next month. It goes on sale in June 2009, with two trim levels available: SE and Sport. Three engines will be available from launch: two petrols and one diesel. All are cleaner and more powerful than the units they replace. 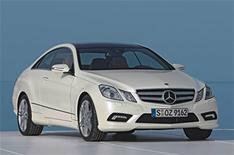 The E350 CDI diesel Blue Efficiency is powered by a 228bhp 3.0-litre engine with 398lb ft of pulling power. It averages 41.5mpg with CO2 emissions of 179g/km. The E350 CGI petrol Blue Efficiency has a 288bhp 3.5-litre engine that produces 269lb ft of pulling power. Average fuel economy is 32.5mpg and it emits 203g/km of CO2. Lastly there's the E500, which is powered by a 383bhp 5.5-litre petrol engine that has 391lb ft of pulling power. It averages 25.9mpg, but no emissions figures have yet been released. A 201bhp 1.8-litre petrol and 201bhp 2.2-litre diesel will be added to the range at a later date. The former will return 40.3mpg and the latter 53.3mpg. Fuel economy is helped because the car is also the most aerodynamically efficient mass-produced vehicle on sale, with a drag co-efficient of 0.24. Safety advances are led by Attention Assist, a drowsiness detection system that monitors the driver's behaviour and sends out an audible and visual warning if their concentration starts to waver. Brakes that are automatically applied in an impending crash, headlights that progressively adjust themselves between high and low beam, plus lane-change and blind-spot warning systems are also available. In the event of a collision with a pedestrian, the bonnet springs up to minimise injury. In addition, passengers are protected by seven airbags, head restraints that react to reduce whiplash injuries and a pre-accident detection system that automatically tensions the car's seatbelts. Rear side airbags are available as an option. Mercedes says it has paid special attention to the front sports seats in the E-Class Coupe. Buyers can opt for electrically adjustable seats that assume a pre-set position at the push of a button, while a ventilation system and four lumbar settings to improve comfort are also available. As well as being fully adjustable, the seats have a special sliding function to make access easier for rear-seat passengers. Ride and handling are controlled by Mercedes' Agility Control system, which controls the shock absorbers to put an emphasis on comfort, but switches to a firmer setting if sportier driving is detected. A sportier set-up can also be achieved with an electronically controlled damping system that the driver can switch between normal and sport modes. Comfort is further enhanced by an improved climate control system and multi-function steering wheel taken from the S-Class.